More and more consumers are questioning the consumption of cow’s milk and the effects that our diets have on cows, the environment, and our health. This is also reflected in the increasing demand for non-dairy milk. Plant milks have been consumed for centuries in various cultures, but their popularity has skyrocketed over the past decade. The range of healthy vegan milk alternatives for drinking, cooking, and baking is huge. Some vegan milk alternatives have sugar added to them, but unsweetened options are also available. Nutritionally, almond milk is quite different to soya or dairy milk. It has fewer calories and much less protein. The small amount of fat in almond milk is healthy unsaturated fat. 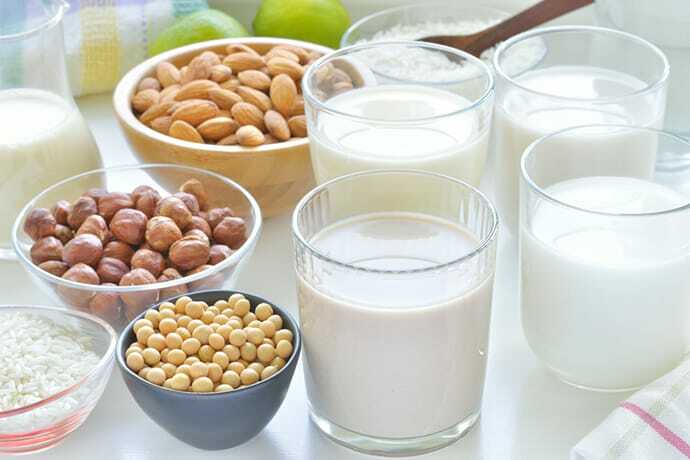 Home-made almond milk can be a rich source of calcium, depending on the quantity of almonds used – it contains powerful antioxidants that can have a protective effect against cancer and heart disease. It has a mild and slightly nutty taste and is ideal for eating with cereals. Almond milk is less suitable for use in coffee as it has a flaky consistency. Cashew milk has a slightly nutty taste and is suitable for cooking and baking. The fat contained is mostly heart-healthy unsaturated fat and can be a great choice for people with diabetes who need to watch their carbohydrate intake. Cashew milk has only about 2 grams of carbohydrates per cup. It is suitable for coffee and adds a thickness that works wonderfully in lattes. Coconut milk is similar to skim milk in terms of calories and is rich in iron, potassium, magnesium, and zinc. It also contains lauric acid, which boosts the immune system and maintains the elasticity of blood vessels. This non-dairy milk is high in saturated fats. It is ideal for cooking and baking and gives food a delicious aroma. Compared to other nut milks, hazelnut milk has slightly more calories and not as much protein. It does contain some fibre, which can aid digestion and lower cholesterol. It also has a delicious nutty flavour, which makes it a great choice for baked goods or adding to coffee. Hemp Milk is made from the seeds of the hemp plant. It is low in carbohydrates and high in fat – but most of those are healthy unsaturated fats. Just one glass of hemp milk can provide 50% of the recommended daily intake of alpha-linolenic acid, the omega-3 fatty acid, which helps support good heart and brain function. It is suitable for cooking and baking and has a slightly nutty taste. Macadamia milk arrived on the scene much more recently than the other nut milks mentioned here and is still not widely available. This nut milk is low in calories but also very low in both protein and carbohydrates. It tastes great on its own and is particularly suitable for desserts and coffee. Oat milk is slightly sweet, with a thin consistency similar to low-fat milk. It contains a moderate amount of calories and has more protein than most plant-based milks. It also has more fibre than other milks, which is important because it helps regulate digestion and can lower cholesterol. Oat milk has more carbohydrates and sugar than many other milks – even unsweetened – so it may not be the best choice for people with diabetes. It is suitable for cooking and baking. Rice milk is less likely to cause food allergies compared to any other milk because it is nut and gluten-free. It has a naturally sweet taste and can be used for cooking and baking. Rice milk is extremely low in calories, which are mostly from carbohydrates, and it has very little protein or fat. Since rice milk is a rather thin milk, it is less suitable for coffee. Of the non-dairy milks, soya milk is the most nutritionally similar to cow’s milk and is the most popular milk alternative so far. It is moderate in calories and is a good source of protein and calcium. Soya milk also contains compounds called isoflavones and phytosterols that can have a protective effect against cancer, cardiovascular disease, and osteoporosis, and can lower cholesterol. It is suitable for a wide range of purposes and can be used without restriction for cooking, baking, or in coffee, and it can even be foamed. As with cow’s milk, soya milk is now available in various flavours, such as vanilla, chocolate, or banana. Spelt milk is moderate in calories and low in protein. As a relative of wheat, it does contain gluten, so it is not suitable for anyone with celiac disease or gluten intolerance. Since spelt milk has a relatively sweet taste, even without added sugar, it is particularly suitable for sweet dishes and can be used as a natural sweetener, for example, in coffee. ProVeg not only points out healthy, cruelty-free milk alternatives but also makes them more readily available. In 2011, ProVeg provided the idea for VeggieWorld – Europe’s first and biggest trade fair for the plant-based lifestyle – and still helps the event organisers with the framework programme and the selection of exhibitors. Furthermore, innovative companies that want to enrich the veggie market with their product are advised and supported by ProVeg.